I don't normally say to myself, "Hey, I really feel like watching a Christian Slater film today." He's not one of my favorite actors and he's had about as many flops lately as Nicholas Cage. But Christian Slater has his moments much like Cage. 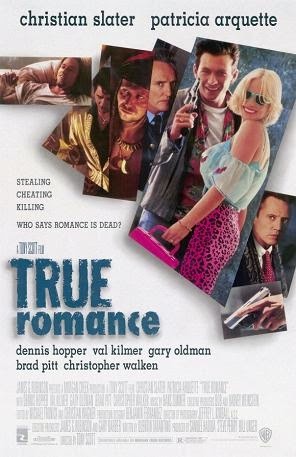 Perhaps Slater's best moment was 1993's True Romance. Since we can all agree that it probably wasn't Broken Arrow. While I wouldn't call his performance spectacular he does manage to not fail spectacularly as I generally expect from him these days. This movie was a ton a good roles, too. Mostly cameos from very accomplished actors like the late Dennis Hopper, Christopher Walken, and an almost unrecognizable Gary Oldman, but they are memorable. There's also a blink-and-you'll-miss-it role from Samuel L. Jackson. Perhaps the only thing missing from this movie is Michael Caine, but he was probably busy appearing in Dennis Miller's wedding video at the time. The man can't be in absolutely everything, can he? Patricia Arquette was also surprising. I can't name too many of her movies without consulting IMDB so I'm not 100% sure of what her true acting prowess is like, but she was really good in this movie. Normally, when characters go the whole "Southern accent" route I kind of gag a little because a lot of them sound condescending. Even if it is a bit unintentional. Patricia's sounded rather genuine, though. It added to her character. She and Slater made a good on-screen couple. However, I think the best on-screen couple was probably Christopher Walken and Dennis Hopper. This film was written by Quentin Tarantino back before he made it big with Pulp Fiction, but just after he made a splash with Reservoir Dogs. You can tell that he wrote it, too. He didn't direct it, though. Considering the amount of faces that we'd later recognize from Tarantino movies I do find that a bit odd, but the late Tony Scott held up his end of the directing quite well. Although I believe that the two of them disagreed about the direction of the film. For starters, this film was actually told with a linear narrative. Tarantino isn't too big on that kind of thing. It's a winner, though. One of my new found favorite films. I think the reason Quentin did not direct this is because he sold the script to finance Reservoir Dogs. He had no money to do the first film with and selling this script helped. I love this flick. The shootout at the end is pretty awesome. Don't you love Brad Pitt's stoner role?